Dr. Sonny Goel offers blade-free LASIK surgery at his Baltimore office, helping patients to reduce, or possibly eliminate, the need for corrective eye wear. If you have ever wished you could start your day without fumbling for your glasses or inserting contact lenses, LASIK can help you to perceive the world around you using only your eyes. 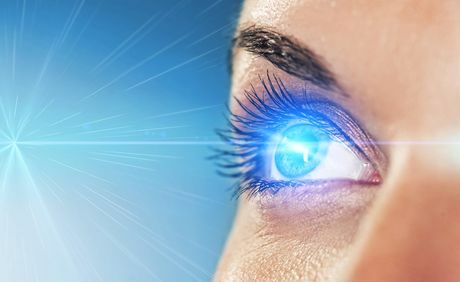 Not everyone is a suitable candidate for this procedure, but Dr. Goel can perform an in-depth examination to determine whether LASIK or another laser vision correction procedure might help you see more clearly. Contact us today to learn more. To understand LASIK (Laser Assisted in situ Keratomileusis), you must first understand how the eye works. When you look at something, light reflects off of the object and passes through your cornea, where it is refracted. The light then passes through the pupil and the lens, which refracts the light a second time. The light finally focuses on the retina at the back of your eye, which transmits nerve signals to the brain. Vision problems typically occur when your eye cannot correctly refract the light and focus it onto the retina. LASIK reshapes the cornea to eliminate irregularities that interfere with the proper focus of light. During a LASIK procedure, Dr. Goel will first create a small flap in the surface of your cornea using a laser - no blades are used at any stage of LASIK surgery performed at our practice. He then uses another highly accurate, computer-guided laser to reshape the cornea. The laser uses Iris registration and ActiveTrak™ 3D eye tracking, which virtually eliminates the risk of error if the eye moves during surgery. After the cornea is properly reshaped, the flap is replaced. No sutures are required. The process is quick, involves minimal discomfort, and takes about ten minutes per eye. The majority of patients report a marked difference in the quality of their vision after the first 24 hours. LASIK is used to treat nearsightedness, farsightedness, and astigmatism. Generally speaking, a LASIK candidate should have eyes that are in good health, with ample corneal tissue. Patients who have especially thin corneas may be better suited for photorefractive keratectomy, a procedure that relies on the gentle removal of the outer corneal cells, rather than a corneal flap, to correct irregularities. Dr. Goel can help determine which treatment is best for you. To get more information about the benefits of LASIK, laser eye surgery, or to find out if you are a good candidate for iLASIK or PRK, contact the practice of Dr. Sonny Goel today. He will be happy to provide you with an initial consultation to determine if laser eye surgery is right for you. He offers highly personalized service and will answer all your questions to ensure that you feel completely comfortable with the procedure. Contact us today to get started on the road to better vision. We proudly serve patients in Towson, Baltimore, and Annapolis.